I wanted to once again thank the gentlemen over at Retro Disney World for their plug of Looking Back at Tomorrow on their recent podcast! On this month's episode, they continue their discussion of Kitchen Kaberat, as well as discuss vintage merchandise, Tomorrow's Child, and finish the show with a fascinating interview with Disney Legend Tom Nabbe, Disneyland's original Tom Sawyer. You can listen to that all right here: Retro Disney World Podcast: Episode 16. Looking Back at Tomorrow is mentioned at the 12:25 mark! Speaking of RetroDisneyWorld.com, another really cool thing I stumbled upon on their site that you'll want to check out are these maps of EPCOT Center that you can print out for your own collection! Two different maps are available, one from 1982 and one from 1986-1987, showing the evolution of EPCOT Center during its first five years of existence. Inspired by a photo posted by Michael Crawford of Progress City USA, these maps were made possible by artist, illustrator, and web developer, Jason of Deep Water Studios. For the past few years, Jason has been working on 3D models of the Horizons pavilion, EPCOT Center and the Mark IV monorail. I encourage you to check out his page and follow his progress. Jason also teamed up with one of the members of the Retro Disney World podcast, Todd McCartney, to start Retro-Replicas, a site dedicated to designing and creating models of certain Disney attractions. 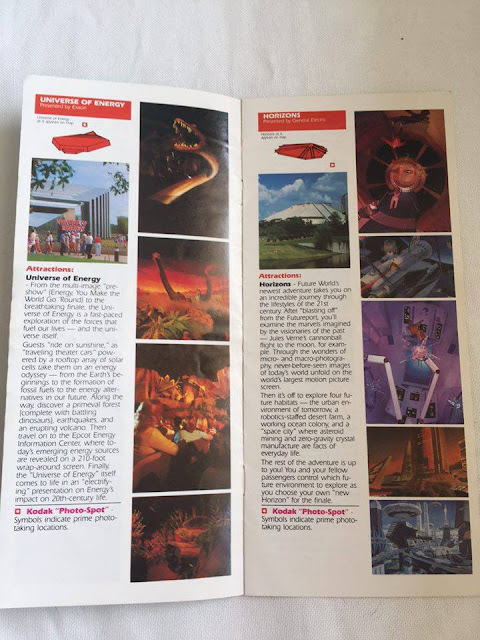 While we're on the subjects of maps of EPCOT Center, I recently had a great chat with one of my readers in Australia, Mike Goulding, during which he sent me a few pictures of the EPCOT Center maps that he has collected over the years. This map from 1983 shows a newly completed Horizons, as well as the empty sites which will eventually become The Living Seas, and the Morocco Pavilion. You'll notice that Norway and Wonders of Life are not even remotely referenced yet. As we jump ahead to 1985, you'll notice that Morocco is now finished, having opened in September of '84, and The Living Seas is beginning to take shape. The spots for Wonders of Life and Norway are still just empty spaces with no explanation of what will eventually go there. You'll also notice that for some reason, the bus stops are no longer labeled in this version of the map. Jumping ahead one more time, we find ourselves in 1988, with a fully completed Norway pavilion, as well as The Living Seas. Wonders of Life is also in its proper place, set to open in Fall of 1989. Like the 1986-87 map before it, the bus stops are once again labeled, but the new addition to the 1988 legend is the Mail Drop Locations. You'll also notice the addition of Disney Traders and Port of Entry at the entrance to World Showcase, which also previously appeared in the map from 1986-87. 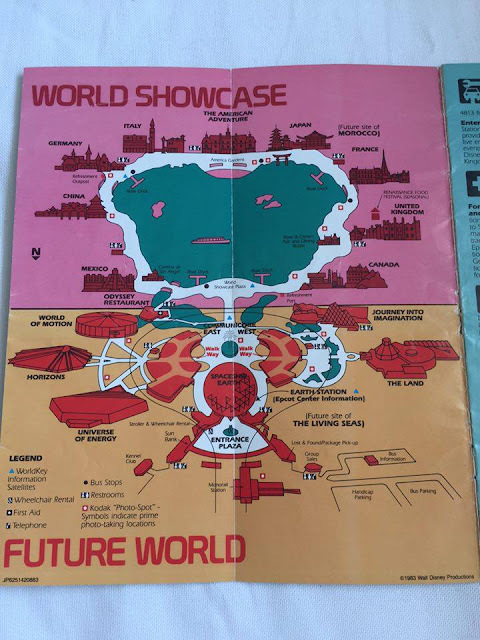 Another interesting addition to the 1988 map is that World Showcase and Future World are no longer divided by separate colored backgrounds. EPCOT Center is now considered, at least by the coloring of the map, to be one single entity. Thanks again, Mike! These maps are the perfect addition to the archive and I really appreciate you sending them to me! I also wanted to thank another reader of ours, Ted Linhart, for a recent message he sent the archives about his collection of historical Disney documents that he has gathered over the years, and if you love historical Disney documents as much as I do, you'll want to check them out here. I was floored at the amount of inter-office communication and signed documents he was able to obtain and it turns out he was able to purchase them all at auction or on eBay, and many of the documents came from auctions held by Van Eaton Galleries in Los Angeles. Everything from correspondence between WED Enterprises and sponsors like AT&T and General Electric to Pre-Opening Epcot Management Binders, to one of my personal favorites, a 1975 brochure for Disney's new transportation division, Community Transportation Services (with an AWESOME picture of the monorail and the Contemporary) are all in there! I highly recommend scrolling through it! As always, thank you all so much for stopping by and taking this brief look back at tomorrow with me. Don't forget to follow me on Twitter @LBATArchives, and like our Facebook page, Looking Back At Tomorrow. Great post, Michelle! My favorite era Epcot map was circa 1992 or 1993, which actually had the physical layout of each of the pavilions inside.